Posted on Thu, Mar 29, 2012 : 10:48 a.m.
Minnesota-based Best Buy announced plans Thursday to close 50 big-box stores and open 100 stand-alone, mobile locations in the U.S. in fiscal 2013. The strategy -- to reduce total square footage while adding small store locations -- comes after the company reported a fourth quarter loss of $1.7 billion. Best Buy, which has about 1,145 U.S. stores, has one location in Washtenaw County, located on Lohr Road in Pittsfield Township. It was not immediately clear whether that store would close. The company has not released a list detailing which stores will be shuttered. 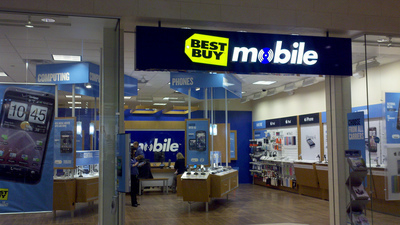 This photo shows a Best Buy Mobile store in Minnesota. Best Buy also recently signed a lease to open a 1,456-square-foot Best Buy Mobile location in Briarwood Mall in Ann Arbor. The mobile store concept, launched in 2007, is much smaller than the company’s big-box stores and acts as a full-service wireless retailer, carrying the same mobile products as the larger stores. There are currently 305 mobile locations, with plans to open 600 to 800 by fiscal 2016. As part of this “transformation strategy,” the company also announced plans to grow its domestic online revenue by 15 percent in fiscal 2013. The plans are expected to cut $250 million in costs in fiscal 2013 and $800 million by fiscal 2015. “We intend to invest some of these cost savings into offering new and improved customer experiences and competitive prices - which will help drive revenue,” said Brian J. Dunn, Best Buy CEO, in a news release. Fri, Mar 30, 2012 : 12:32 p.m. Uh oh....this concept sounds like when Borders closed a bunch of stores and opened up &quot;Borders Express&quot; locations in malls....how'd that work out? Fri, Mar 30, 2012 : 11:39 a.m.
Well you go to ABC Warehouse and they are so pushy! Guess they are paid on commission. No browsing there! Go to Best Buy and no one to help you out. Guess I will stick with Amazon. Sorry but it is getting so there is no help. Try going to J C Penney's, Sears, KMart, etc. No one on the floor and some are so empty I am amazed how they stay open. Fri, Mar 30, 2012 : 11:28 a.m. I spent $2,500 on a home theater for my new house this year. I bought everything (TV, receiver, speakers) online. B&amp;M stores are doomed. Fri, Mar 30, 2012 : 10:44 a.m.
Fri, Mar 30, 2012 : 4:02 p.m. Some items I could see shopping online. But heavy appliances such as refrigerators, stoves, dishwashers, etc. I'd rather go to the Best Buy or retailer and check them out. Is that way of shopping obsolete? Fri, Mar 30, 2012 : 3:07 a.m.
Big Georges is locally owned---we should be supporting them anyway. Fri, Mar 30, 2012 : 1:35 p.m. Overpriced, poor selection, pushy sales people. No thanks. Fri, Mar 30, 2012 : 1:42 a.m. I think Best Buy is over the hill andwon't be around in five years. The business model is becoming obsolete. Fri, Mar 30, 2012 : 1:57 a.m.
You're absolutely right, Tim. The lower end stuff is available at Target/Wal-Mart, and the nicer stuff will always be the domain of specialty retailers... And internet warehouses pick up the rest. The irony is that Best Buy created the business model, ran their smaller competition out of business, and are now getting hammered by internet retailers. Fri, Mar 30, 2012 : 12:35 a.m. I don't see them closing the Lohr Road store, since it is the only Best Buy in Washtenaw County. Fri, Mar 30, 2012 : 12:27 a.m. The Ann Arbor store has always been on the high end of profitability for the Best Buy chain. It is highly unlikely with only 50 stores closing NATIONWIDE that this store is on the block. The are a lot of stores that do not perform as well. When Borders was closing, believe me the Liberty street store was NOT on the block until all was lost. Thu, Mar 29, 2012 : 6:34 p.m. I doubt very much that Best Buy would close one of their flagship stores, especially when it serves such a wide area, and one that features a steady stream of transient residents who represent the core electronics and gadget buying demographic. The store on Lohr will not be closed any time soon. Fri, Mar 30, 2012 : 1:54 p.m.
Oh yeah? Why are then opening this new store a mile away....just across 94 from the other one?? Fri, Mar 30, 2012 : 1:59 a.m.
Perhaps, but the difference between a daily newspaper and the Ann Arbor Best Buy is that one of them is still profitable to operate. As a whole, the chain may be losing money, but I'll bet the Lohr Rd store is still in the black. Thu, Mar 29, 2012 : 6:50 p.m. Funny, they said the same thing about daily newspapers and the University community. The fact is, when you are in this core demographic, you're more likely to see the advantages of purchasing this type of product online. Thu, Mar 29, 2012 : 6:09 p.m.
What about the people who don't shop online and want to talk with someone? Not everyone is buying local products. I would like to buy something other than local products and still get a good deal! Thu, Mar 29, 2012 : 8:13 p.m.
Thu, Mar 29, 2012 : 6:29 p.m. If you want to talk to someone who has more than the most basic knowledge about what you want to purchase, Best Buy isn't the store for you. Thu, Mar 29, 2012 : 6:08 p.m.
No No No! If we close Best Buy - the closest one would be in Canton/Westland! Fri, Mar 30, 2012 : 1:53 p.m.
Did you not see they are opening one basically across 94 in Briarwood? Thu, Mar 29, 2012 : 8:05 p.m.
i would think with the uofm in town they would stay. canton and other will go first. Thu, Mar 29, 2012 : 6 p.m.
Best Buy is making a move before they become the next Borders. Everyone complained that Borders didn't stay afloat because it was browse at Borders, buy on Amazon. Now that Best Buy wants to be ahead of the curve, the same people are here complaining. The same thing that happened with Borders is the same thing that is happening with Best Buy. Why pay for so much real estate and employ staff to be a showroom for Amazon. These same hypocrites are here complaining because they are loosing their Amazon showroom. Thu, Mar 29, 2012 : 10:34 p.m.
That was said very well. But do you think the right people understood what you were saying? Some people just don't get it. And then they wonder why our economy is in the toilet. Thu, Mar 29, 2012 : 6:02 p.m. I meant 'losing' in the last sentence. This is good news for smaller, local companies trying to compete with Best Buy. I always shop at Huron Camera in Dexter. Although Best Buy has cheaper prices, their sales reps are pretty ignorant to specific tech questions. In addition, it just feels good to know that your money is supporting a local store. Maybe if Best Buy closes, another local specialty camera, computer, and electronics store can open in Ann Arbor. Thu, Mar 29, 2012 : 5:19 p.m. Stopped going to Best buy years ago. When I could get no help. Walked into back of store to the TV dept and 5 employees walked right by me and never said a word. They all looked to busy to help me. Told manager on way out and have not been back. Fri, Mar 30, 2012 : 11 a.m. I have found the exact opposite to be true, I'm always offered assistance by several very helpful sales staff. Thu, Mar 29, 2012 : 8:43 p.m.
Did you ever stop to think that they really were too busy to help you? Retail can be chaotic. They are certainly in a good location with a large population center very close by. I don't think it would be in their interest to shutter the store on Lohr. Although, it woudl be good to point out that it is a lot easier getting many items that BestBuy has online. Especially when it comes to electronics accessories. BB is horrendous with prices for cords (especially HDMI). Thu, Mar 29, 2012 : 5 p.m. I like BUYING at Big Georges but hate SHOPPING there. The salespeople are very pushy. I research online and browse Best Buy before ultimately going to Big Georges where I can bargain them down. Ever since they got out of the camera business, I only go in there when buying the big stuff like appliances and big screens. I go to Best Buy whenever I need a new laptop, external hard drive, phone upgrade, etc when waiting for shipping isn't an option. Otherwise, like others, all my electronics shopping is now done online. Sat, Mar 31, 2012 : 9:58 a.m. Agreed . BGeorge is very good at bargaining with you. I buy most all of my appliances there. Why isn't Obama saving them with a bailout. Americans are losing their jobs! The moral of the story is the government should not pick winners and losers. Fri, Mar 30, 2012 : 12:21 p.m.
Fri, Mar 30, 2012 : 12:31 a.m.
Where in the article does it say the government is going to bail them out? Fri, Mar 30, 2012 : 12:24 a.m.
Thu, Mar 29, 2012 : 8:41 p.m.
johnnya2, his point is that propping up businesses that are clearly failing because of poor business practices is not a good thing. He is right. Chrysler has been failed out twice in 30 years. Twice they have received corporate welfare from Democratic presidents. Something tells me that they will fail again. I do agree that government(e.g: business) investment in infrastructure makes sense. Do remember that the funds you speak of are NOT generated by government, but by businesses who pay taxes and hire employees who pay the taxes that enable the government to build roads, maintain parks, protect the environment, etc. Thu, Mar 29, 2012 : 7:55 p.m.
Yeah, that $700 billion dollar stimulus that Obama gets beat up on all the time, despite the fact that GWB started it, is actually going to cost the government just $32 billion -- worst case. If either AIG or GM stock goes up in value before the government decides to sell it, the number goes down. In reality, the government could make a profit on the stimulus if it's willing to hold the AIG and GM stock as other investors do until it's profitable enough to sell. What a concept. Let alone that it saved the US from a second depression, millions of lost jobs and homes, higher unemployment, lost taxes, the collapse of the US manufacturing sector, just to name a few things. Thu, Mar 29, 2012 : 7:46 p.m. I AGREE!!! A flat tax. You make dollar you pay .10. You make a million you pay $100,000. What could be more fair Why should other american subsidize you for the choices you make. I wonder if Obama would bail out Walmarts if they were going under. Over a million american depend on them. Walmart is the largest employer of US workers in the united states. Thu, Mar 29, 2012 : 4:55 p.m.
Thu, Mar 29, 2012 : 4:32 p.m. I buy just about everything now on the internet. Prices are better and haven't had a problem with returns. No parking problems and Amazon Prime has free shipping. I know some will say I should support my local retailers, but times change and with everything costing so much I need to get the most for my money. Thu, Mar 29, 2012 : 4:27 p.m. I love shopping at Big George's, and I'd buy everything from them if they had better financing options...Best Buy usually offers 18 months no interest, Sears (who I totally LOATHE, but grudgingly shop at because of good financing) usually has 12-15 months no-interest on larger purchases. I've only seen 6 month financing at BGeorge's and with their higher-end products it makes it difficult to budget. Fri, Mar 30, 2012 : 1:39 p.m.
Financing at 0 percent makes sense, just don't miss any payments. Free money is good. But, if you have to take out a loan to buy a home electronic device??? Fri, Mar 30, 2012 : 11:11 a.m. Consider saving your money and only purchasing when you have the money. Financing is a bad deal. Thu, Mar 29, 2012 : 4:11 p.m. While I have no research to back it up, electronics are throw away items nowadays. You buy something realizing it is only goin to last 5-10 years before it needs to be replaced. As a result, I don't think many people are purchasing &quot;store&quot; warranties anymore, a place where they made a lot of money. Plus, you can buy electronics and appliance anywhere nowadays including places like Lowe's, Home Depot, Sears, Target, Bed Bath and Beyond, K-mart and Meijer's just to name a few. Oh, and that internet thingy has some things on it too. Thu, Mar 29, 2012 : 4:34 p.m.
10 to 15 years is pushing it nowadays. My MAC guy told me the other day that the usable life of a MAC hard drive is about 3 years. And the average washer is now only good for about 7. Thu, Mar 29, 2012 : 3:47 p.m.
50 stores closing of 1,145 stores = 4.36%. Look for closings in nearby MI counties where there are multiple stores, creating market saturation (single county, multiple stores). Also, disregard the new Briarwood store as an indication of Lohr-Road displacement. The Briarwood store strategically offers marketing presence in a strong shopping center. In other words, rest easy, as the Lohr Road store is safe (for now). Thu, Mar 29, 2012 : 3:20 p.m.
Fri, Mar 30, 2012 : 5:15 p.m.
....OR you can walk around Best Buy for hours and not get any help. I've experienced that a few times. Fri, Mar 30, 2012 : 12:52 p.m.
Wow, you get someone to talk to you at ABC Warehouse?! I stopped going in there because I always had to hunt someone down. I guess I looked like money wasn't falling out of my pocket. At least at Best Buy, someone would say &quot;Hi&quot; and asked if they could be of help. Thu, Mar 29, 2012 : 8:45 p.m.
No need for smarty pants, SMC. I totally understand what Barzoom is talking about. You can walk around in Best Buy for hours just looking at stuff and the staff just casually ask if you need any help, and walk away when you say no. At George's and ABC you have a salesperson hovering over you and following you around the store. Thu, Mar 29, 2012 : 6:26 p.m.
Yeah, I too hate shopping at places where the staff try to help you. How dare they try to service their customers. Thu, Mar 29, 2012 : 3:04 p.m.
Could be good news for Big Georges and ABC Warehouse. Bad news for consumers. Thu, Mar 29, 2012 : 3:02 p.m.
acts as a full-service wireless retailer, carrying the same mobile products as the larger stores Great another phone store!